What Is The MSI Gaming App? How To Download and Install the MSI Gaming App? How To Link The Mobile App? How To Add Videos to Dragon Eye Playlist? What Games Does Dragon Eye Support? How To Launch MSI Gaming App On Windows Startup? 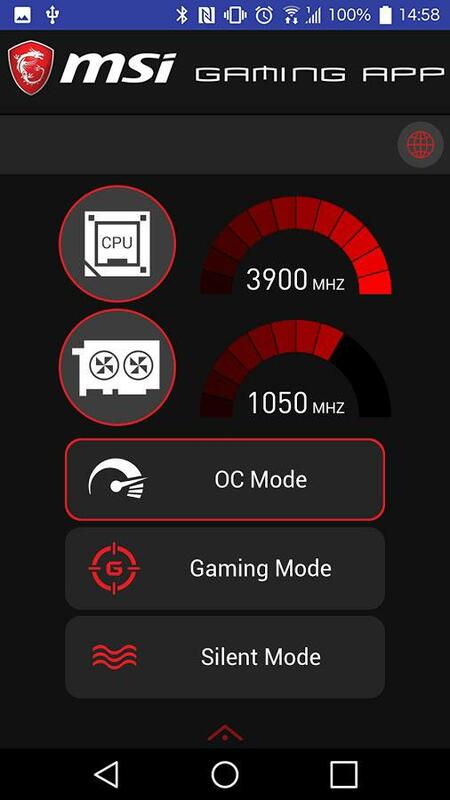 The MSI Gaming App is a standalone program designed to work exclusively with MSI GPUs to enhance the performance of said hardware, specifically within the context of gaming. 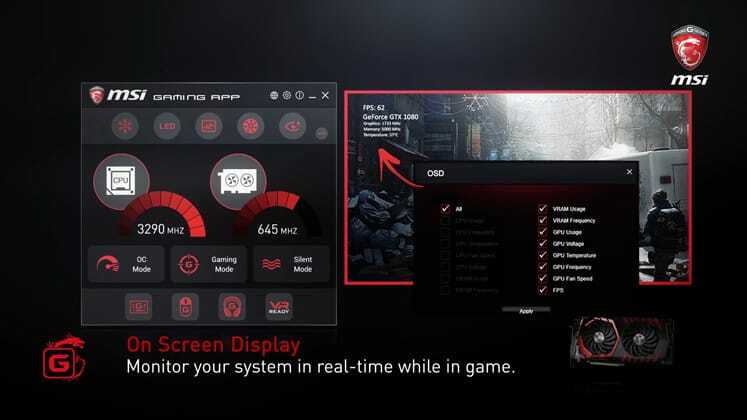 Through the various settings and options in the MSI Gaming App, gamers can fine tune their GPU and system as a whole from both a performance and visual point of view. Performance profiles; one-click switch between three predefined profiles or modes, which are OC Mode, Gaming Mode, and Silent Mode. Each if fairly self-explanatory but for the sake of clarity OC pushes the GPU beyond its factory settings for better performance, Gaming Mode provides a slightly smaller boost for a better in-game experience, while Silent dials down on system power for lighter tasks and lowers fan speeds. Adjustable screen contrast; a tool that allows the user to adjust the screen contrast depending on requirements. There are three settings: Eye Rest (lighter tones for tired eyes and nighttime use), Gaming (higher contrast levels and colors that ‘’pop’’), Movie (sharper image through dynamic gamma and contrast adjustment ideal for a cinematographic session). Each of the settings is customizable through contrast, brightness, level, and gamma settings for global fine-tuning or color specific tinkering. LED; control LED illumination with effects (breathing, double flashing, flashing, random), styles, 16.8 million colors, synchronization, palettes, and even sync up with music. Changes can be made to all lights or on an individual basis per LED strip. Only works with MSI GPUs equipped with RGB lighting. VR Toggle; a one-touch option that switches the PC to high-performance settings to maximize the VR experience. Dragon Eye; watch a video or live stream while gaming through a customizable overlay that sits on top of the in-game window. The size, volume, position, and transparency are all adjustable with the possibility of assigning hotkeys to trigger playback and change the volume as required. Particularly useful for tutorial and walkthroughs, alongside some light entertainment (eSports, traditional sports, TV show, etc.) during in-game farming or grinding. Cooler Boost; a function that kicks up the fan speeds on the GPU to lower temperatures rapidly. Turning off Cooler Boost reverts to normal fan operation speeds. On-Screen Display; provides an overlay with real-time FPS, usage, temperature, fan speed, voltage, and clock speed data for the CPU, GPU, and VRAM. Fully customizable in terms of what is displayed and the font size (so it doesn’t impede on full view of the gameplay). 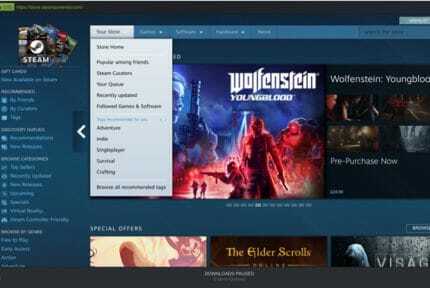 Smartphone App; works in unison with the desktop program and allows users to switch profiles remotely without having to alt-tab out of a game for example. Mouse Master; assign macros and define DPI settings for compatible mice. MSI Gaming App comes bundled in the driver and utility software disc shipped with MSI GPUs. Otherwise, you can download it directly from the MSI website. 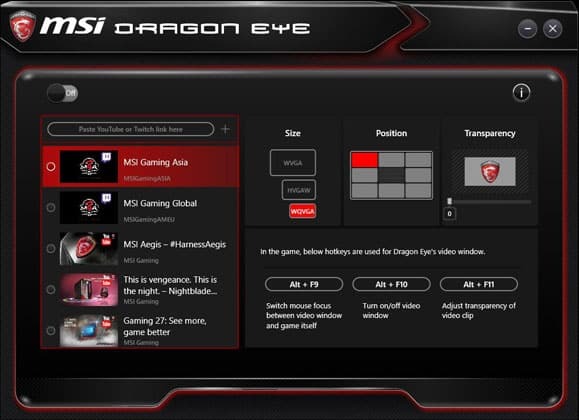 Visit the MSI website here and click on the red highlighted ”download the latest version” link in the second paragraph adjacent to the logo of a dragon behind a capitalized letter ”G”. See the image above for simplicity. Once the ‘’gaming_app_6.zip’’ file has downloaded, unzip, and double click on the executable file. Follow the installation wizard to complete the process. Open up the MSI Gaming App by double clicking on the icon on your desktop or finding it via the start menu. Once open, Click on any of the large mode buttons running horizontally near the bottom of the app window. Unfortunately, the MSI Gaming App has no inbuilt mode customization tool nor is it possible to create a custom profile. 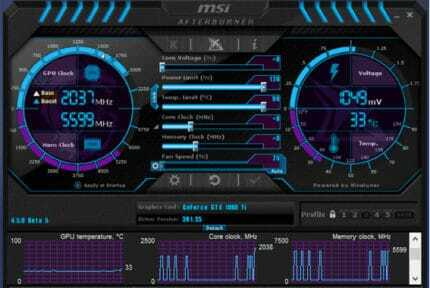 We highly recommend investigating MSI Afterburner which offers an extensive arsenal of tools and settings including the ability to define custom profiles for specific games. Open up the MSI Gaming App and click on the ‘’LED’’ icon running horizontally near the top of the app window. 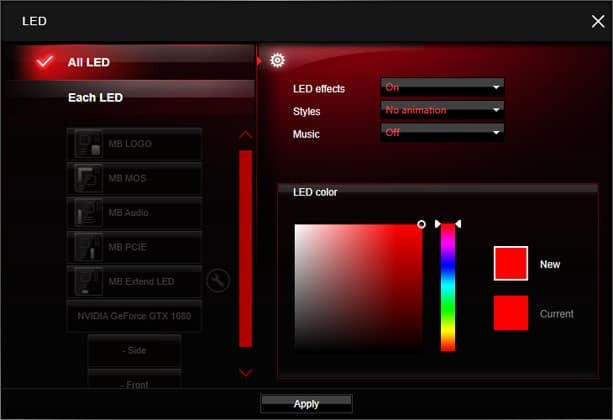 In the window that appears, select ”All LED” to change settings for all LED strips. Alternatively, select ”Each LED” to assign individually. Under ”Each LED”, you’ll see the GPU alongside all the customizable LED strips (side, front, etc.). On the right-hand side note the drop-down menu for ”LED Effects”, ”Styles”, and ”Music” as well as the LED color choosing tool just below. After tinkering and settling on a light show that suits you, remember to hit ‘’Apply’’ to save the new settings. First, download the mobile version from Google Play and connect both the PC and phone to the same Wi-Fi network. Open up MSI Gaming App on your desktop and click on the ”Remote Control” icon among the icons in the top right-hand corner of the app window. It is the furthest left icon represented by a circle with horizontal/vertical lines running through it. In the new window that appears, define both a name and password, then click ”Apply” and close the window. Select your ”Paired Device” from the list of the same name (will match the name just created on the desktop app) and enter the password. Click ”Connect” to finish the process. From here you switch profiles remotely using your mobile phone. Responsiveness is all but instantaneous although this is dependent on the strength of the Wi-FI network in use. As it stands, Dragon Eye only supports videos or live streams sourced from YouTube and Twitch respectively. Copy the link to the YouTube video or Twitch live stream you want to add. Click on the ‘’Dragon Eye’’ icon represented by a dragon’s head running horizontally near the top of the screen. Paste the link in the ‘’Paste YouTube or Twitch link here” section in the menu on the left. Click on the ‘’+’’ sign to the right. The video or live stream will now appear among the list of videos. You can remove videos by hovering over the top and reorder them by dragging them up and down to create a playlist. The Dragon Eye feature currently supports Dota 2, League of Legends, Counter Strike: Global Offensive, Battlefield 4, Shadow of Mordor, Half-Life 2, Call of Duty: Advanced Warfare, The Witcher 3: Wild Hunt, Heroes of the Storm, Resident Evil 6, Diablo III, and more. To see a full list of games, click on the Dragon Eye Icon running horizontally near the top of the app window and then click on the ”Help” icon represented by the letter ”i” enclosed in a circle in the top right corner. New games are being added regularly by MSI, but the offering remains stark. Here’s to MSI adding more games rapidly. Click on the ‘’Settings’’ icon in the top right corner of the app window. The icon is the typical cogwheel associated with most settings menus in modern software. Tick the ‘’Activate MSI Gaming App When Windows Starts’’ option. MSI Gaming App now forms part of the startup programs and will appear in the taskbar from now on.